OK in this blog, we're making one of our early budget sheets public. If you are interested, please follow this link to a spreadsheet PDF showing the budget structure. We have also included a pie chart (below) to show how it looks visually. Since the spreadsheet is already self-explanatory I will not say much in this blog, except to state that for obvious reasons we cannot provide every detail. 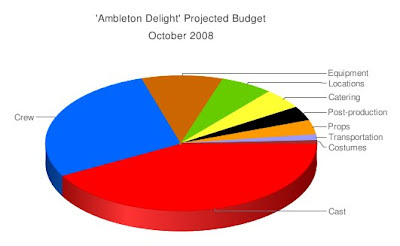 Also, this is the projected budget prior to filming (circa October 2008), so is what we estimated would cost just over £5,000 in total. In reality, by the end of the production (ie April 2009) we were closer to £6,000, with several departments clearly exceeding the budgeted amount for various reasons that we will likely cover in later blogs. As for 1.Catering, don't get us wrong - we did provide food for cast and crew! We just decided to make it ourselves rather than ordering a whole lot of sandwiches. (this will be explained in a later blog). And we could keep the cost down for 2. Equipment as we used what the production company already had. The same goes for 3. Costume & props – we asked the cast to wear their own clothes and used what we had for props. So our main advise for those considering making a feature is not to aim too high unless you are loaded with money. Don't aim for a 35mm period drama project as your first feature! Aim for a project that is viable using what you already have. Feel free to use the spreadsheet we have provided as a guide for your own production. And any questions regarding the budget please feel free to make a comment or contact us. Hi there, this is a great blog and VERY helpful! I'd love to see your budget structure as I'm trying to get my own 1st feature made, but the PDF only seems to have blank boxes on it?